HTML5 includes the concept of a canvas. As with the artist’s version of the physical canvas, you use the HTML5 canvas to draw images onscreen. Using the canvas makes it easier to manage various sorts of drawings that you need to convey information to the user. A canvas is simply a drawing area onscreen. To create a canvas, the browser you interact with must support HTML5. This means that you need to use newer browser versions, such as Internet Explorer 9. The size of the canvas is always in pixels. When you have a canvas to use, you can create a context to it by obtaining a reference to the canvas element and calling getContext() with the type of context you want, such as 2D. The context lets you use various drawing commands to create graphics onscreen. The advantage of this approach is that the server can create a wealth of graphics for the client and send the cached <canvas> tags to every client that needs them — creating an efficient method for sharing graphics. Many developers find this approach confusing. Many organizations use maps for all sorts of interesting purposes. 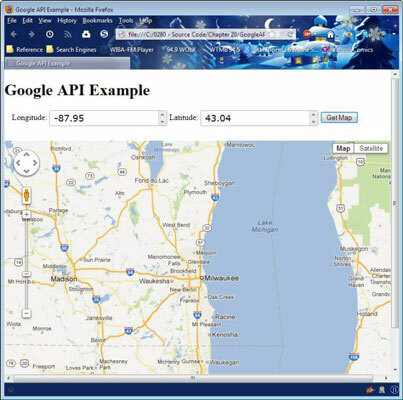 This article provides some additional ideas on how you can use the Google Maps API with your browser-based application. To use this example, you must obtain a developer key. Google provides two kinds of keys: paid and free. You need only the free key for this example. The paid key does provide considerably more flexibility, and you’ll likely need it for any full-fledged application you create. It’s best to create the code for this example in several steps. The first is to add the usual jQuery references. In addition, you also need to add a reference to the Google Maps API, as shown here. This example won’t work at all unless you replace the words, Your Key Here, with the key that you receive from Google. Consequently, this particular step is important because it’s the one step you must perform. // Create a list of arguments to send to Google. // map options to Google. // map: during page loading or by clicking Get Map. Notice the use of the step option to perform this task. Latitudes range from 90 degrees north to –90 degrees south, so the example reflects this requirement. Likewise, longitudes range from 180 degrees west to –180 degrees east of Greenwich, England. The GetMap() function performs the actual task of obtaining the map. To do this, your application must create a list of map options. The example shows a simple, but typical, list. The most important of these options is where to center the map. In this case, the map automatically centers itself on Milwaukee, Wisconsin, but you can change the settings to any location you want. The example uses a zoom factor of 8, and you’ll see a road map. The Google Maps API actually provides a number of map types that you can try. There are two times when GetMap() is called. When the application loads, you see Milwaukee, Wisconsin (unless you change the default settings). After you change the inputs, you can also click Get Map to display a new location.